Crunch time is in full gear at the J-league, with only 9 games left in the season! Clubs are starting to count on their fingers and toes, how many points they need to avoid relegation; unfortunately, with so many clubs bunched up in the bottom half, it's going to be a very close one this year. Most cautious managers have been saying something like 35 points or more. Thank god it's Friday, and I'll be able to do a bit of writing this weekend to cover the goings-on in the J1, as well as start onto the National Team ahead of their trip to Europe. From the messages I've been getting, I know many of you are looking forward to the next two international games :) We also have the All Stars game to look forward to. The J1 fixtures this weekend are probably going to be more towards the stubborn, and I see many of the matchups can go either way. Very difficult for any team to assume a win. Between Gamba and Antlers, I'd say Gamba have an "easier" nine games left, but then again the J has shown us nothing is guaranteed and the freakiest things happen (well, that's a given in football!). I'm also concerned about Nagoya Grampus. They were dealt a double-punch this week when along with their manager Nelsinho who was relieved of duties last week, it was announced that Luizao was heading back to South America also -- to join the very same Nelsinho at Santos FC. I KNEW it... As I said before, Luziao came to Japan only as a favor to Nelsinho, and I guess having had difficulty fitting into the Japanese style of football he decided to cut his losses and split. It didn't help that Nagoya is doing so poorly of late, either. This Nagoya mystery is something I've sort of ignored over the recent months, mostly because I got too caught up on other clubs. But hopefully I can catch more of their games remaining, and get a better understanding of their team. Unique Celtic Tees at www.Sixtee7.com! The creative minds at Sixtee7.com called my attention to one of their new designs, a Meiashi Nakamura tee (mei=notable/reputed and ashi=leg/foot). 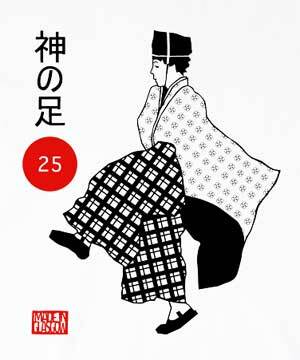 The big characters say "Kami no Ashi" (Foot of God), and is followed by Nakamura's jersey number 25. Oops, I just realized I didn't have this entry tagged to show up. A little late, but here's some news of Kazu's possible move to Sydney. Japanese football pioneer Kazuyoshi Miura may be packing his bags for Sydney, where he will become the first Guest Player in the recently revamped A-league. More importantly if he goes, he will be included in the roster when Sydney FC arrives in Japan for the Club World Championship (CWC) this December. At the age of 15 "Kazu" decided the best place to learn his craft was in the football nation of Brazil. He ended up spending 8 years there, becoming fluent in the art of football as well as Portuguese. Since his first professional signing with Santos FC at the age of 17, he has continued to seek new challenges and destinations, making this sudden possible move to Australia seem like a natural next-step in his career. The invitation for a temporary 3 month contract from Down Under is not entirely out of the blue. Sydney coach Pierre Littbarski has spent a good portion of his life in Japan. The former West Germany international was right there with Kazu, who was then at Tokyo Verdy, Zico, and a host of other stars when the Japanese professional league launched its first season twelve years ago. Before coming to Australia "Litti", as Japanese fans still fondly call him, was coaching at Yokohama FC -- the club Kazu just joined this year. If this deal goes through, it will mean Miura will be the only Japanese player taking part in the CWC. J-league clubs Yokohama F Marinos and Jubilo Iwata failed to make it past the group stages of the Asian Champions League. As hosts of this glamorous first-time international club event, the East Asian island nation would clearly like to have one of their own participating. There is no better candidate than the Shizuoka-born ex-international who played an integral role in the transition of football awareness in the country from the amateur to professional, from the domestic to international. 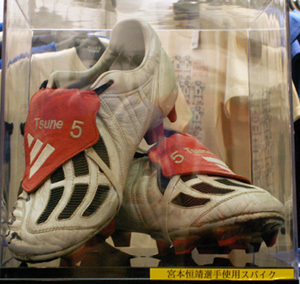 Miura's peak may have been a decade ago, when he became the first Asian player to score a goal in the Italian Serie A and was awarded the AFC Asian Player of the Year. After Italy, his only other stint abroad was at Croatia's Dinamo Zagreb. But it is because he epitomizes a high standard of sportsmanship, professionalism and heart that people still want great things for him. At 38, Miura remains one of the most charismatic personalities in the domestic league. His sudden transfer from Vissel Kobe to J2's Yokohama FC this summer attracted more attention from the media than any other this season, and his presence at the second division club has almost doubled the turnout. 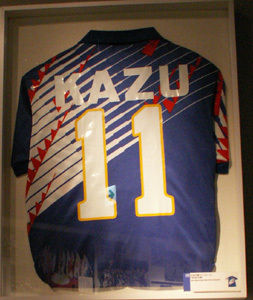 Fans want to see him score and witness his famous celebratory "Kazu Dance". Yokohama, who are currently in 11th place in the table, are not against letting him go. They understand what an opportunity it would be for the veteran star. However, they would like to hang on to Miura as long as the possibility of promotion to the first division exists and want to hold off on decisions until mid-October. Eking out a third place finish could still offer promotion through play-offs. With a career brimming with challenging firsts, Kazu Miura is more than used to finding himself in difficult situations. He has stated that he can't think of a single player who wouldn't want to grab such a chance to play in the CWC. Other than stating his honest wishes he has kept quiet on the matter. Local media have already jumped ahead and predict that November 6 may be his final game day in the J2. This is the most number of players playing for European clubs called up to a Japan national team in our history. There was talk that some of the core players in defense (Nakazawa, Miyamoto, Kaji) were going to fly directly from the All Stars game to Ukraine for the second game. But Zico said that he didn't want to exhaust the players with a 15 hour flight for one game and has decided to not call up any of the All Stars participants). The only brand new call was Kawasaki Frontale's Minowa -- who just scored a winning goal, his first, in last weekend's game. He is a 29 year old defender standing 187 cm tall. I was just thinking that it was about time someone from Ardija or Frontale to get a call up, especially with all the All Stars people missing. But I never thought it would be a defender! Though the defense is probably the most thin right now in the above roster. But probably the most exciting names were Matsui and Okubo's. Takayuki Suzuki has made a comeback to the squad after getting cut for the EAFF Cup and the Honduras game. Zico said that he was probable going to start with the group that started against Honduras but change things as the game moves in one direction or the other. He mentioned that the poor start in the Honduras game would be unacceptable in a World Cup game, that they were luckily able to overturn the score in the end but in Germany it would be very difficult. Tsuboi broke his nose in the last league game, and Tanaka is also carrying injury. Hopefully they will get better soon! As for who is captain, Zico said he'll be thinking about it as the game approaches. Though I mean... it's obviously going to be Hide (though I don't think the labeling does him any good). The two Urawa players, Santos and Tsuboi, will first play the Nabisco semi-finals on the 5th and then fly to Europe. The rest of the team will fly to Europe on October 4. Hidetoshi Nakata started for the first time in the Premiership in this match against Portsmouth. From what I hear, he did quite a good job and was a presence on the pitch. That was Frontale's call for support as they welcomed Omiya Ardija at Todoroki Saturday. It was a silly but fun concept, having people buy and drink fresh orange juice before the game. In Japan, we often "eat" the opponent before the game -- for instance, if we play India, eat curry. Or if we play Korea, we eat kimchi or the Korean barbecue (Yumm... you don't need to give me an excuse to eat these!). So to beat Ardija and keep their winning streak going, the club used Ardija's club color of orange to rally. After the game, I saw one of the Frontale players downing a whole glass in one glug. I don't know if it was thanks to the OJ, but Frontale did win 2-0. It sounded like a great effort from Omiya, but again, like they did last week against Jef Chiba, they put on a good show but failed to convert. It's not the best habit to get into -- I mean, with 9 games left you'd rather have them play poorly but eke out a win rather than the opposite. Frontale's first goal, six minutes after the second half began -- a wonderful long feed from scrawny but promising Nakamura gave Ganaha just the perfect speed to burst forth and slap the ball in. It was an elegant performance from the striker. And only six minutes later, a free kick was awarded Frontale on the left. Manager Sekizuka put up a froth to object to the dangerous charge on Juninho, and that could have been what caused Omiya's momentary lack of focus. The ball was met by Minowa's head and gave him the opportunity to celebrate his daughter's birth with mates on the pitch. Frontale players said that last year Omiya's tight defense didn't allow them to move forward with effective vertical passes. Omiya were known to have given Frontale many problems when the two were in the second division. "But today there was openings in several places," Nakamura said, "I think it was because they were using zone defense." This match-up was the "other" spotlight game of the weekend, and came hours before the Kashima Gamba hoopla. Reds in particular wanted to win this one and push closer to second-place Kashima. Marinos dwindling in 10th also wanted to start a string of winning performances as we headed into the final third of the season. It could have been a back and forth scoreline, but instead ended in a draw. Both sides created a large number of great chances, but it was interesting that we didn't see many mishaps in defense. With Reds Tulio and Marinos Matsuda sitting out the game, the two back lines were somewhat new -- Nakazawa was shifted to a rare start as a center in the back 3; Horinouchi for Tulio. On the whole, Marinos were possessing better, using passing and working their way through the midfield for better setups. Reds used individual dribbling to dash through to the other side, and didn't use the sides as well as they could have. What was a little frustrating was that Reds sidehalfs were not able to go up much, and instead Tatsuya Tanaka and Nagai were spending a lot of time on the sides to make up for it. Which is a one good option, but there should have been more variation. Marinos's defense has been really stabilizing since they returned to the 3-back, and despite the position shift of Nakazawa I didn't see anything weird about him in center. It's a good indication of his flexibility, both at club and on the NT. With difficulty getting through the defense, it was not surprising that both teams rocketed many mid and long range shots. But nearly all of them lacked accuracy, and to be honest I really hope the level of mid-range shots gets better in the J-league. I think it's half mental and half a technical problem -- a few small adjustments and more clear thinking building up to contact. I guess it's easy for me to say. Ponte for Reds and Oku for Marinos, both did a good job directing traffic. I was also liking Magrao, Marinos' newest acquisition. He's played a few rounds now, and in this game was great at picking up balls and intercepting. I think he is part of the reason the Marinos defense has been stabilizing. The sides -- sigh. This continues to be a problem. Alex Santos was pretty much invisible this game, and Yamada did make some crosses but overall Reds used the central path too much. The amount of work that forwards did was commendable, but in the end unnecessary if Reds had a clearer plan on how to get by these tough situations. Marinos sides have had a challenging year too. Hayuma Tanaka returned to the pitch for the first time since his car accident, and put on a spirited effort but he sort of looked like he was in his own bubble a bit. Dutra was surprisingly off too. Towards the end of the game, Reds really shifted their gears up. They created some good overlapping sequences, pushing numbers forward. But there seemed to be confusion on "who's gonna get that?" on that last pass. Maric came on in the second half with a black face guard/mask on -- it was good to see him in play after his injury. The score could have swung either way, back and forth, but in the end stayed still. I think it was an entertaining match, but looking at position-by-position issues, especially on the midfield (sides and offensive halfs), I think it wasn't as sophisticated a game as we should have seen from such quality teams. Given the content, I'd say a draw was fair. Another dramatic finish from Osim's men. I like the Chiba sytle, Osim Football, but lately their game content hasn't been all that great. The media picked up on the Maki-broken-finger story -- apparently the doctors said that if he compounded the injury he'd probably have to operate. Maki said screw it and played anyway. Lucky for the team that he did. Shimizu had the lead at 32 mins, a perfect header from Cho Jae Jin. But Abe's penalty kick equalized matters seven minutes later. The PK was awarded when two defenders clobbered Maki during a set piece. Shimizu had the upper hand in the first half, but Jef seemed to come out of the lockerrooms more collected and improved in the second. But the game dragged on without any change to score, and just when we thought that was it, a very nice approach from Jef allowed Maki a winning goal. Mizuno attracted the defense, sent a through to Kurita, who crossed (shot?) from the right. The ball went horizontally to the far where Maki slid in to push it carefully in. It was the 89th minute. He's not a skillful player, but he certainly uses what he has and makes the effort to contribute in any way he can! This was Jef's last game played at Ichihara stadium -- I was surprised the crowd was so thin. I guess no one really had any personal attachment to the stadium, but after watching the packed crowds at the Gamba and the Reds stadiums, it felt rather lonely. From joy to despair to... relief...? With the four offensive players maintaining pressure up front, Kashima forced Gamba's sides to retreat back and support their three-man defense line. The resulting space created in the midfield allowed Mitsuo Ogasawara to make good approaches up from defensive midfield. I scared my neighbors by letting out a loud "YES!" when Ogasawara scored at the 9th minute. Alex Mineiro controlled the cross from Masashi Motoyama and waited a second for the Antlers captain to dash up through the back line. A soft through pass and Ogasawara had the course he needed to take a quick left-footed swipe to the right of goal. With a whopping 64 goals under their belt this season, and two-thirds of that coming from their offensive triangle (Oguro, Araujo, Fernandinho), it was only a matter of time before Osaka would snap out of their stiffness and squeeze out a goal of their own. After receiving from Fernandinho, left sidehalf Takahiro Futagawa's cross vetoed Masashi Oguro's head and fell perfectly to an open Araujo at the far post for a well-timed volley at 23 minutes. The home side could have made that a double when a counter-attacking Araujo found himself face to face with goalie Hitoshi Sogahata 13 minutes later. But the uncharacteristically hesitant shot was smothered by defender Goh Oiwa. Ogasawara's free kick five minutes before the end of the first half won his side a valuable lead heading in to the lockerrooms. A low near-horizontal kick from the left of the box zipped past all and curled comfortably to the inside netting untouched. Upon returning in the second half, Gamba's resurgence was lent a helping hand by goalkeeper Sogahata when he mishandled a back-pass at 51 minutes and assisted forward Oguro to his first goal in four games. Gamba took this as their opportunity to retrieve their rhythm and spirit, and both sides put on a dizzying fast-paced show. Sogahata redeemed himself 20 minutes later when he deflected a shot from Yasuhito Endo in a dangerous one-on-one encounter. Kashima got a few shots of their own, the most promising an Ogasawara through-pass to Takuya Nozawa for a direct effort which was caught by keeper Yohsuke Fujigaya. Both managers upped their attacking ante with a total five substitutions to their front lines in a span of fifteen minutes. The home team used individual dribbling and technique; the visitors, multi-player overlaps and mid-range shots. All seemed lost for Kashima when Banpaku stadium erupted in joy at the 89th minute. Oguro caught the ball to the left of goal, and instead of taking the shot himself gave the honors to Araujo. The prolific striker aimed calmly and notched his 27th of the season. Normally composed manager Akira Nishino threw his hands up on the sidelines, relishing this valuable moment over the four-time League Champions. The story should have ended there. Two minutes of injury time was all the elated home side needed to endure. But here again is Gamba's style -- they remained unwaveringly on the attack. It was topsy-turvy time, as Antlers centerback Daiki Iwamasa was sent up as a third forward. A long feed from the back dropped to an open area on the left via Iwamasa's pressure in the air. Takayuki Suzuki picked it up. Outnumbering the Gamba defense, it was simple matters for the former Heusden-Zolder lefty to slap the ball over to a waiting Alex Mineiro. A truly dramatic last-minute equalizer. If any of the supporters had hoped today's match would presage this season's ultimate Champions, they may have been disappointed by the 3-3 scoreline. But with only a point separating the two clubs and nine rounds still remaining, any result tonight would have been a premature indicator. As we head into the homestrech, these two stylish clubs will most surely be in the spotlight. The Gamba players were NOT happy after the game, giving up their win for a draw like that. In particular I wonder how much Miyamoto's thoughts will influence the team awareness going forward. Should there really have been only TWO defenders in the bottom half of the pitch in the last minute of a winning game? Personally, if I was a Gamba supporter, I'd be pretty ticked by that. Kashima outnumbered Gamba 3 to 2 on that last minute goal. I don't understand what all the other players were thinking. Nishino seemed unperturbed by that allowance, strongly sticking to his party line of being an attacking club. But "attacking" should not mean "unwise". A day of deft touches and good vision from Shunsuke Nakamura, and great finishes from Craig Beattie for both goals. Celtic allowed Inverness the first goal in the second half after some poor finishing in the first. Soft touches from Shunsuke and Shaun Maloney gave Beattie entrance for his first shot. Shunsuke quickly leapt to fix his error and set up a great lone run by Beattie for his second. Cup game against Falkirk that took place mid-week. Shunsuke's pass from right to Maloney zipping up left, and thru to Zurawski for goal. Perfect cross from Shunsuke to Hartson for an extra-time winner. I'm pretty bad with directions, but my first trip to the JFA House went perfectly -- thanks to the extremely detailed >>instructions they provided on their website, and the fact that there are signs about every block you go! 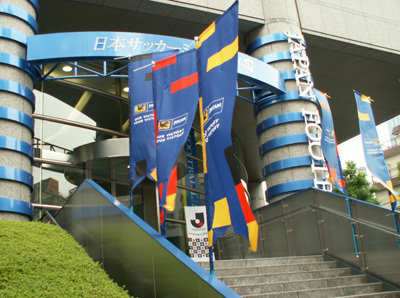 It certainly helps that the road to the JFA House is called, well, "Football Avenue" (or JFA Dori, in Japanese)... and the building is big and has the unmistakeable JFA emblem on the side. Here we are...hard to miss this entrance. The first floor lobby is airy, with a number of eye-catching displays. The three flat screen monitors are showing three different videos -- one shows the Confed Cup game against Brazil; one shows the Asia Cup 2004 highlights with interviews (Nakamura, Fukunishi, Miyamoto, Kawaguchi, Koji Nakata were some of the guys I saw interviews of); and the last is a highlights/interview video of the World Cup qualifiers. 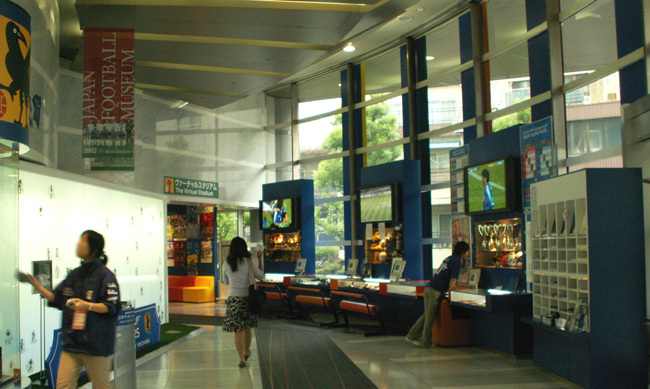 Under the screens are display cases of football souvenirs, toys, dolls, key chains that have been collected from half a century back, the Kirin Cup trophies, etc. But the first things you see are these two babies -- the one one on the left is the national teams case, with the t-shirt that was created right as we qualified for Germany, a signed ball, the Asia Cup silverware. 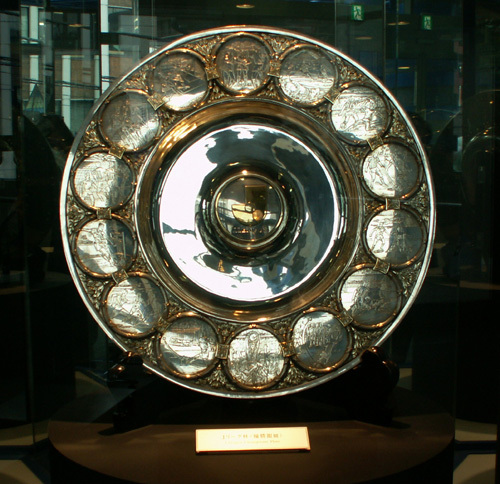 The silver plate on the right is the J.League championship trophy -- the league changed to a one-season format, and now with ten games left to go, things are really heating up in the race. Who will we see holding up this plate? There's a medium-sized screening room with, look at this beaut, a 2m x 10m screen. They are featuring three different shows right now, and I watched the J.League 2004 highlights review. The room is actually a mini-gymnasium, and I guess they use the room for other events and activities. My only gripe would be that the volume was waaaay too loud. And my ears are just recovering from sitting near the drums at the Kashima game the last time! 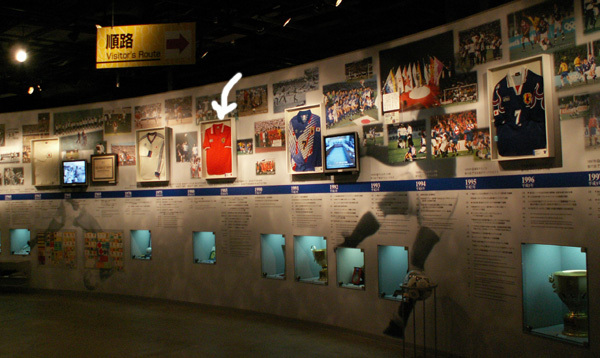 After strolling through various photo displays, of the history of Japanese football (I like the black and whites from the 1960s, and from the Pele Farewell game), the Hall of Fame, etc, I spent a little time playing here. The analog and the digital both -- the little boy with his father was having a blast playing Winning Eleven, so I watched him play for a while too. Nothing like being outclassed at video games by a 5 year old... sigh! There were displays in this room also, but the one that caught my attention were these two letters. The one underdeath is FIFA asking how Japan would feel about co-Hosting the 2002 World Cup with Korea (emphasis on "co-"). 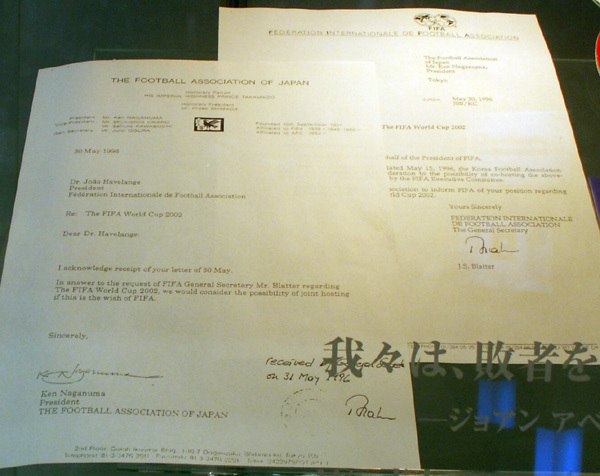 You probably know the basic story, but it was a very stressful time for the JFA -- and for the Korean Football Association as well. Neither side wanted to give up the priviledge of hosting, but being bitter rivals, co-hosting just didn't sound very appetizing. There was a lot of backstage political coups d'etat, with Korea throwing their hat in at the last moment. 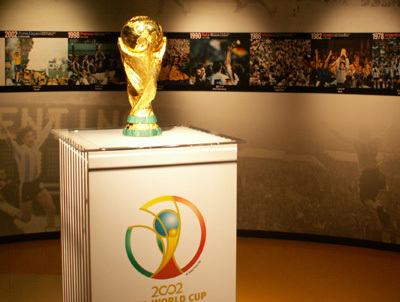 Both sides resented the other, but FIFA came up with this idea that the two countries could co-host (I believe it was the first time in history). The letter on top is Japan saying "we're okay with the idea". It turned out to be an inspired idea -- I don't think either country could have done as thorough a job if they had to take on responsibility for the whole thing, and one party would be crushed at losing out on the chance to host. Not to mention it would have aggravated the animosity. 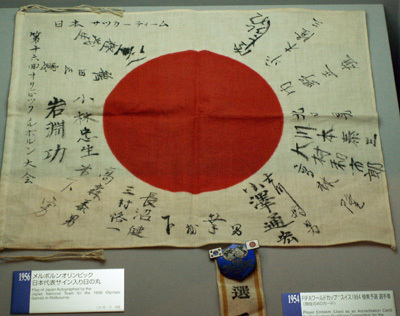 But the Cup went very well, and it was a turning point in the relations between Japanese and Koreans in the mainstream. I checked out the shop of course. The store has its own line/brand, on top of all the club and NT goods; they even sell these goofy items. The guy managing it was really nice, and we chatted about what types of people are buying what. 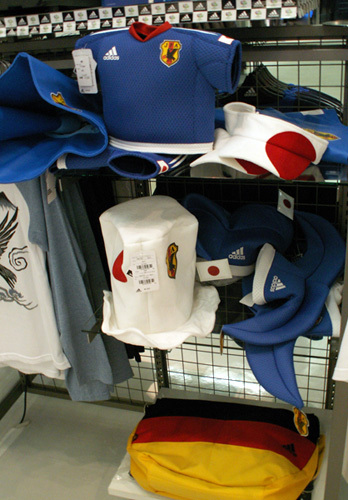 The JFA gets a lot of visitors, obviously, and he said that their stocks on national team gear are already almost gone, aside from the replica jerseys which are produced at great quantities. 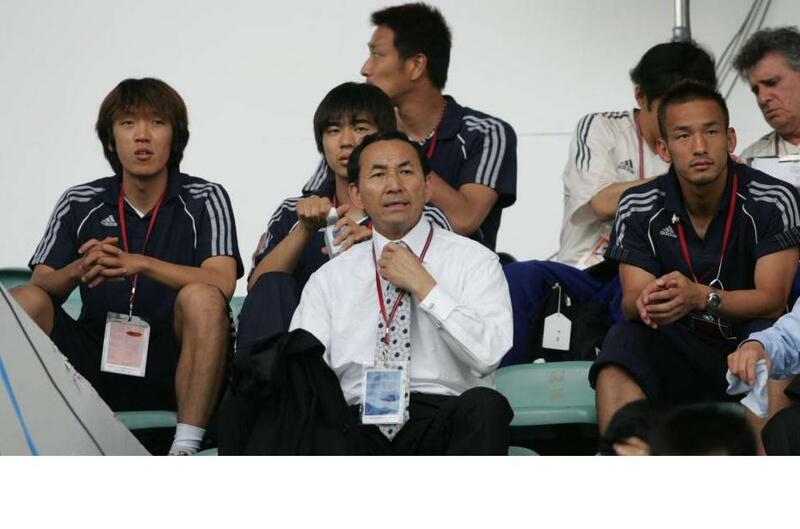 He said that in particular the navy polo shirt the team wears when they are going from hotel to stadium for a game, are particularly popular and were even more in demand after the North Korea game -- when we saw shots of Nakamura, Hide, and other players sitting out the game in the stands (photo). Nothing sells like these guys! 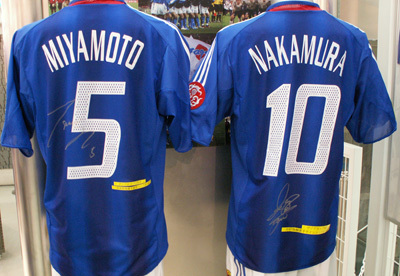 And signed Miyamoto and Nakamura jerseys -- and Miyamoto and Konno shoes. Okay, so up til now was all the free stuff. To go further, you have to pay \500 to see the main World Cup displays and all the techie stuff. A dramatic mural greets you as you step down to the lower level. I just had to take a photo of this famous jersey... though it brings back sad memories of Doha. Can anyone find a photo of Kazu's back taken after the game? The one where one shoulder is lower than the other and he's sort of slumped on the ground. 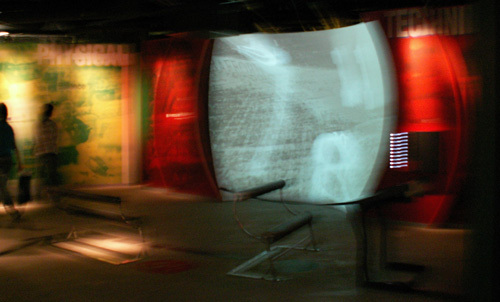 The museum used a dizzying number of monitors and screens, all showing different things. A lot of them were interactive, and the touch-screens allowed you to choose what/who you wanted to see. 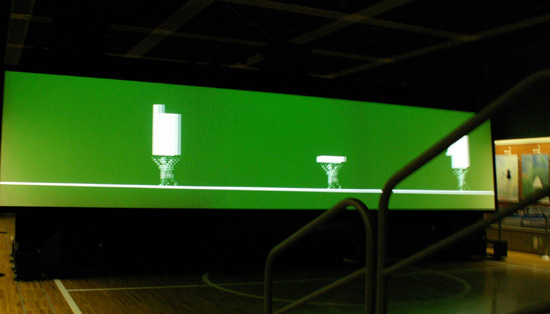 Probably the coolest screen they had were these two spherical screens -- a design affectation, but still gave the impression of high-tech. Like watching the images projected on the inside of a ball. 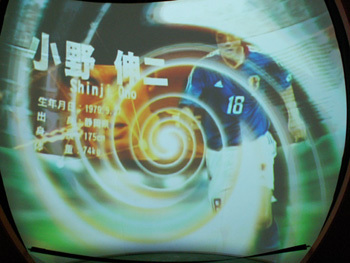 You could push buttons and choose which players' super-plays you wanted to see; the photo in the middle is showing a Shinji Ono video on this round screen. In a different corner, you could check out tactics -- using a touch-screen, you could learn about the tactics, in defense and offense. 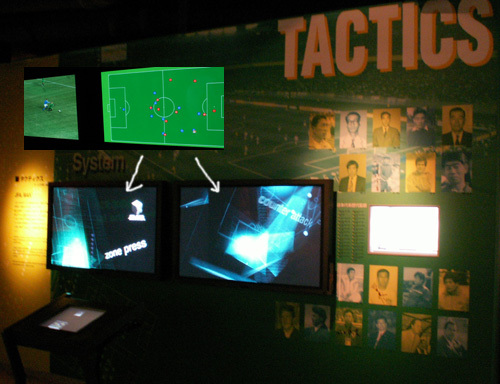 A video of the example ran on the left flatscreen, and a moving diagram of the example ran on the right -- so you can see how all the players moved to cover each other and set up the play. Don't be scared! It's only a cardboard cut-out. 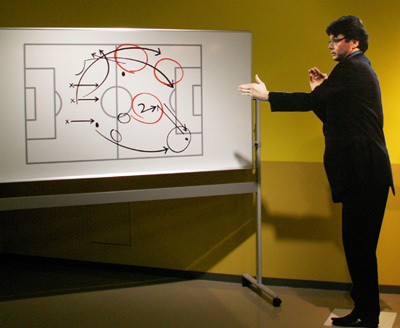 :) Troussier barking out his instructions for the Flat-three strategy he held so dear. A "lockerroom" with all the World Cup squad's uniforms, shoes, etc. And a display of the staff paraphernalia. The Cup is starting....! Let's huddle. 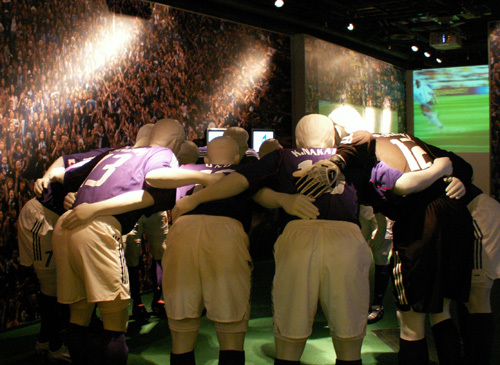 Life-size models of the squad -- the faces resembled too. On the right, you can instantly recognize Miyamoto, with the black mask he became so famous for (he broke his nose); it became quite the trend (not to break your nose, but to wear those masks when cheering on the team). Of course, the Copa itself. 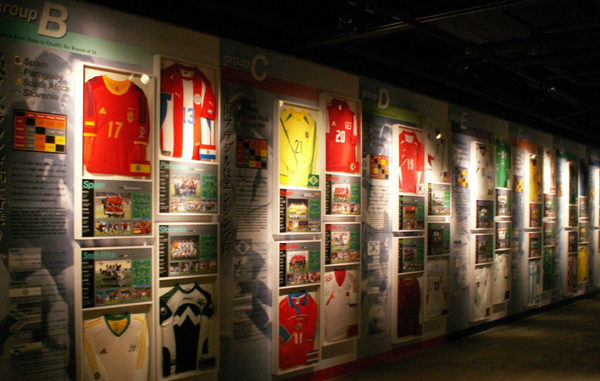 Then we open up to a room full of jerseys from all the representing nations, their formations, results, and descriptions. 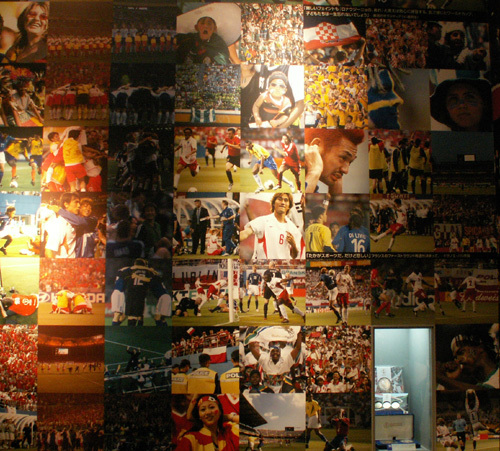 The opposite wall was lined with a collage of photos from the event, along with World Cup memorabilia, tickets, etc. There were about ten flat screen monitors in this room as well, showing highlights of various games. 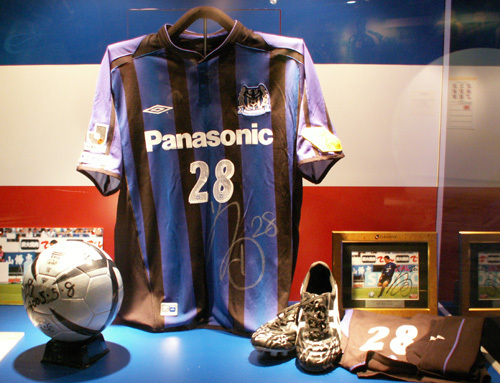 Right now they are showing an Amazing J exhibit, of all the J league teams. 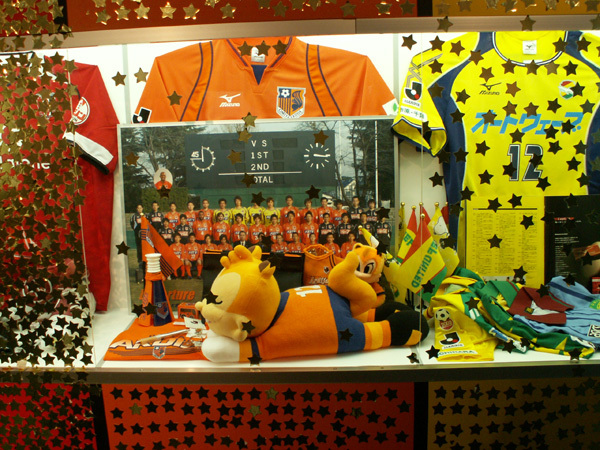 You get a star sticker when you enter, and you get to stick it on the display case of the team you like. 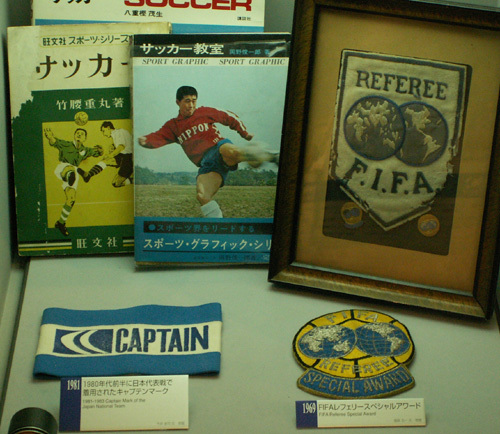 The most star-covered were the usual suspects -- Gamba, FC Tokyo, Marinos, Antlers, etc. But I love this Omiya Ardija mascot doll, called Goodnight Ardy (Ardy is the name of the mascot, a squirrel). It is so adorable -- I think you're supposed to use it like a pillow. And the photo in the middle is Ogasawara's shoes -- with grass and dirt still stuck on the points (click photo to enlarge, and you can see the grass bits). 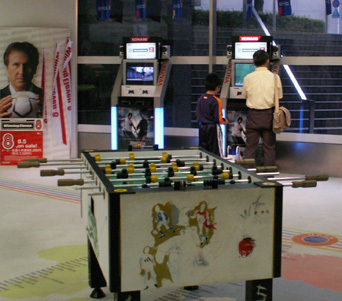 There was another touch-screen here too, where you could choose your favorite team and player, and hear their greetings. They also shared a little tidbit about themselves, so you got to "know" them better. 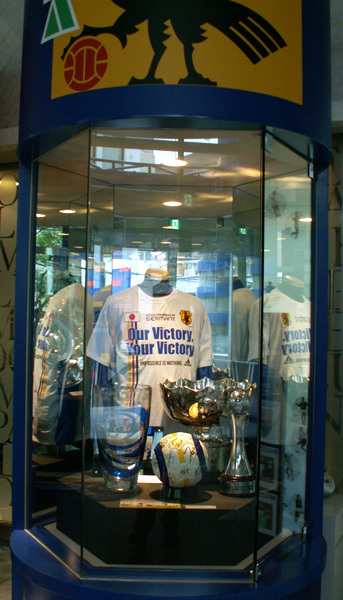 And the photo on the right is a display for Gamba Osaka's Masafumi Maeda, who scored the Ten Thousandth goal in the J. Okay, that's about it. I've overloaded the blog with a year's worth of photos, but I hope you have enjoyed the brief tour. It goes without saying that I've skipped alot of stuff, and most of the really worth-it items have to do with the numerous videos being shown on all the screens and monitors. Everywhere you turn, you will see autographed shirts, shoes, balls, posters, just sitting there, and I think considering the museum is still relatively new it is a very nice exhibit. They will continue to change the exhibits and videos as the months pass, so maybe I will go back in a year or so.